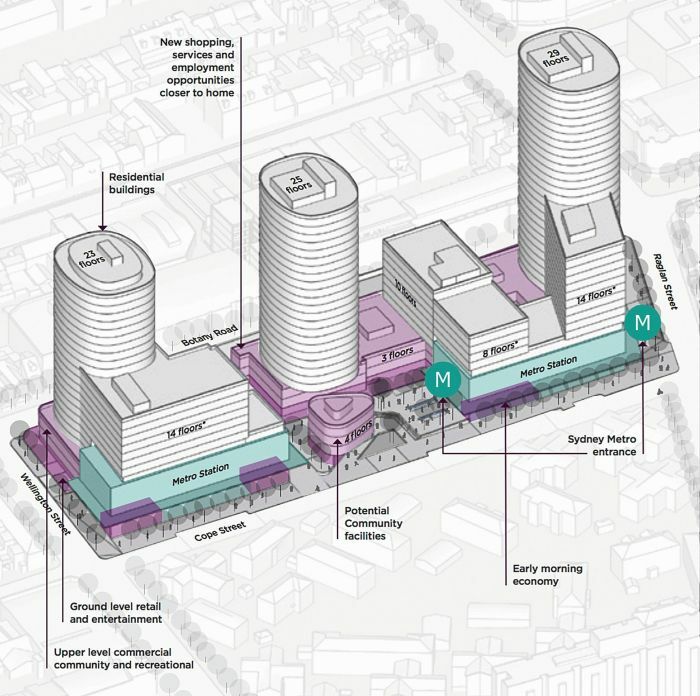 UrbanGrowth NSW Development Corporation (UrbanGrowth NSW) and Sydney Metro have prepared a masterplan and a concept development application for the Waterloo Metro Quarter to sit above the approved metro station design. Both are on exhibition for public comment by January 30, 2019. 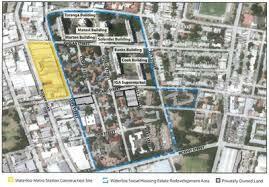 The State Significant Precinct (SSP) Study contains the masterplan for the Metro Quarter. It includes all the studies required by the Department of Planning and Environment (DPE) and City of Sydney Council for a masterplan and new planning controls for the Metro Quarter. Many studies are the same as for the Waterloo estate. Introduce a development control plan (DCP) to provide detailed design controls and principles for future development in the precinct. A publicly accessible plaza of approximately 1,400 square metres fronting Cope Street, with access into the metro station [the size isn’t clear as the SSDA doesn’t specify]. The concept development application will be used by the appointed developer to create the final design of the development for both the station and the buildings above it. 1-4pm, Friday January 18, Redfern Town Hall. 10am-1pm, Thursday December 6, Waterloo Neighbourhood Centre. 10am-1pm, Thursday January 17, Waterloo Neighbourhood Centre. 11am-1pm, Wednesday December 12, Waterloo Neighbourhood Centre. 11am-1pm, Wednesday December 19, Waterloo Neighbourhood Centre. Bilingual Russian and Chinese workers will attend all of the above events except for the drop-in sessions. Chinese outreach briefing – 11.30am-12.30pm, Thursday December 13, Waterloo Neighbourhood Centre. Submissions must be made directly to the DPE as comments made at information sessions don’t count as input into the exhibition. SSDA exhibition website: majorprojects.planning.nsw.gov.au and follow the “currently on exhibition” links. DPE has also produced a Q&A sheet and made available other material. As the information is spread across five different sites REDWatch has brought all the links together in one place at www.redwatch.org.au/RWA/Waterloo/wmquarter/181122sspssda/.